This pose is oh so tricky! If your knees don’t touch the floor and you feel like your muscles are clenching to hold your legs up, try placing a block or rolled up blanket underneath each knee or thigh. If you are able to lean forward and still keep your spine long, do so! And if your hands or elbows can press out into your thighs and knees, this will encourage rotation of the femurs in the hip socket. Your sockets can withstand a lot of pressure here, so don’t be afraid. Exhale when you push. With this pose you can lessen or increase sensation by moving heels closer to or further away from body. Press lower body down into mat and lengthen upper body as you hinge at hips to come to forward fold. Move feet to feel comfortable. Sit with your legs straight out in front of you (raise your pelvis on a blanket if your hips or groins are tight). 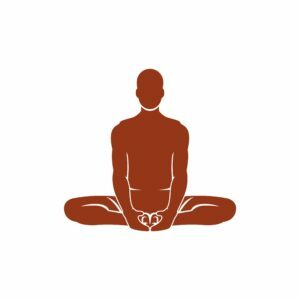 Exhale, bend your knees and pull your heels toward your pelvis, then drop your knees out to the sides and press the soles of your feet together. Grasp your big toe of each foot with your pointer finger and thumb. Lift out of your hips and lengthen through your side bodies. Drop your shoulders down your back and squeeze your blades together. Lift through the crown of your head. Nothing to add except to reiterate the idea of not focusing on the knees going down, but releasing the groin muscles. Relaxing the around the knees may the hips let go as well. Namaste. Once feet are pressing together, try bringing your hips toward feet instead of sliding feet toward hips for a different way of getting fully into pose. Try not going into your fullest expression of the pose right away and allow your breath to help gently release the muscles. Wiggle a bit from sit bone to sit bone to find a place of stability as you settle and breathe.